It’s time Pittsburgh! 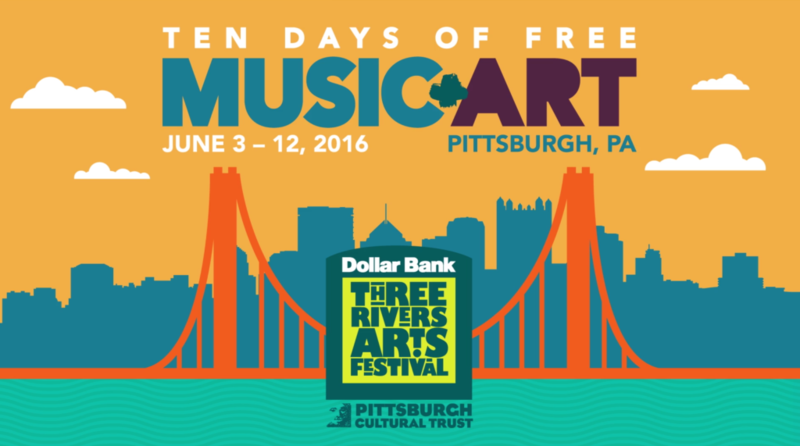 The Three Rivers Arts Festival is here! Three Rivers Arts Fest is the biggest summer event every year in Pittsburgh, so we are honored to be participating once again in the amazing Artists Market. 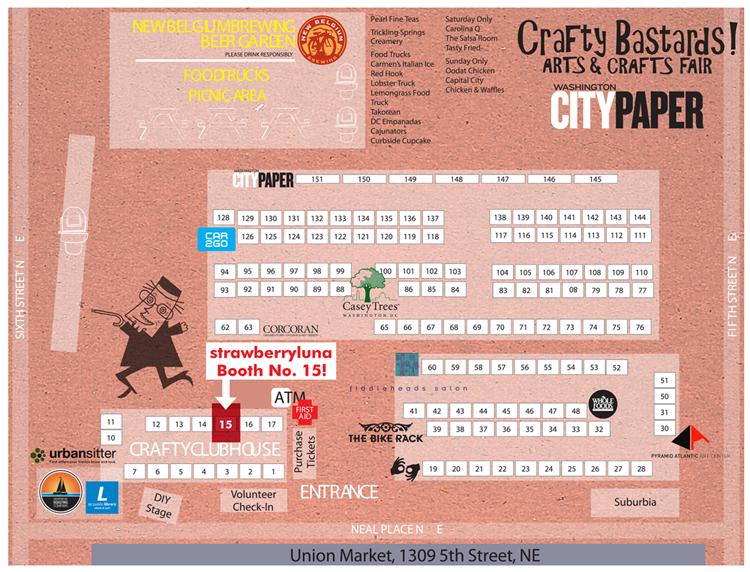 This year we are at Booth #61 from Friday June 3rd to Tuesday June 7th (only!) – right on Gateway Plaza and Penn Avenue Extension and we can’t wait for the adventures this show always brings. Founded in 1960 by the Women’s Committee of the Carnegie Museum of Art, Three Rivers Arts Festival has presented, during its vast and varied history, more than 10,000 visual and performing artists and entertained millions of residents and visitors. Such notable and memorable stage performances have included Ella Fitzgerald, Ray Charles, Phillip Glass, Steven Reich, Smokey Robinson as well as literary legends Allen Ginsberg and Spalding Gray. Contemporary dance artists Bill T. Jones and Arnie Zane, Lar Lubovitch, Pucci:Sport and many others have performed, and within recent past, concerts have featured Norah Jones, The Avett Brothers, Wilco, Sonic Youth, The Wailers and the Black Keys. Click here for this year’s musical line-up! 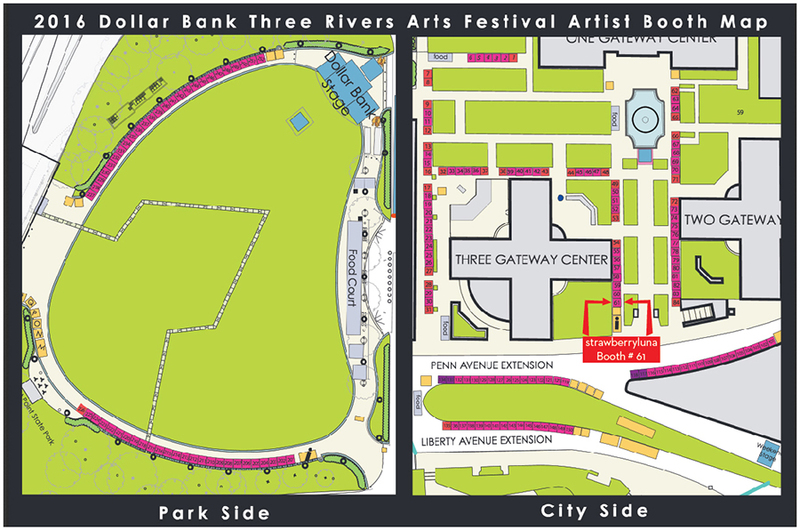 And here is a handy map for you to find your way around the Artists Market and music stages too. See you there Pittsburgh! Come join us for our 1st ever appearance at the Mt. Lebanon Artists’ Market in the beautiful & lovely Mt. Lebanon business district. We are excited to be a part of the action this year, at Booth 206! 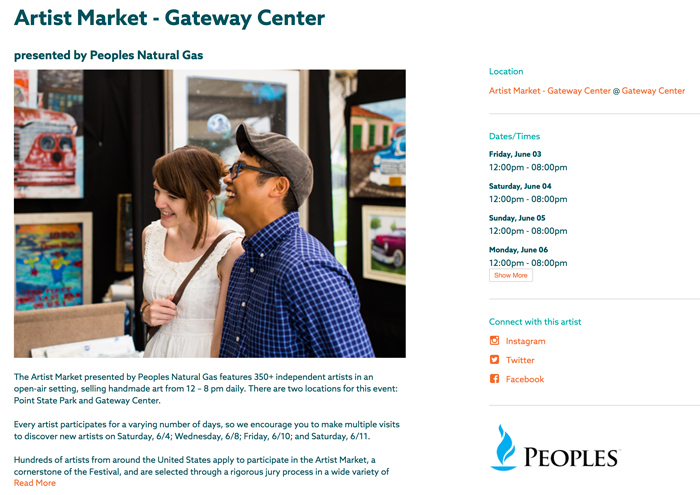 About the show: The Artists Market will take place on the streets of Academy Avenue + Washington Road in Mt. 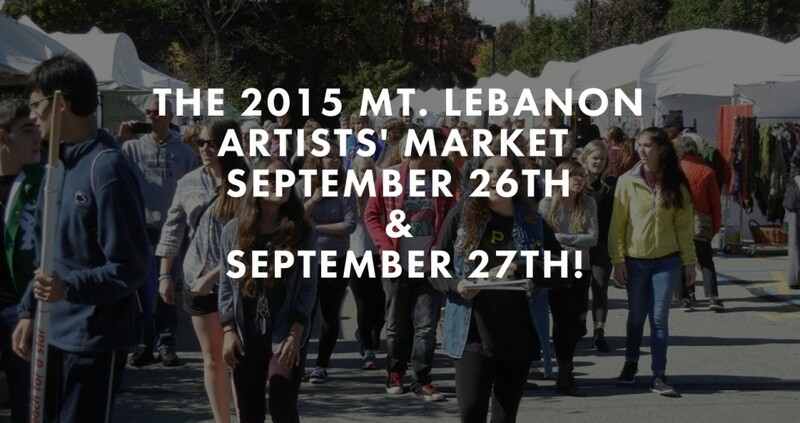 Lebanon on September 26th and 27th 2015 as the two-day fine-arts fair will once again make Mt. Lebanon a focal point of the Pittsburgh art world. As a juried arts festival, The Artists’ Market will include 80 booths featuring professional quality, original art in a variety of media. This will include 2D work, jewelry, wood, sculpture, glass, ceramics, fiber, wearables, mixed media, leather, and metal. Touchstone, a nationally recognized craft center in the Laurel Highlands, will feature demonstrations of various art media. Additionally, there will be an impressive food and entertainment component that is sure to please audience and artists alike. Here is the List of 2015 Participating Artists. This annual contemporary fine art and fine craft festival is FREE to attend and family friendly. 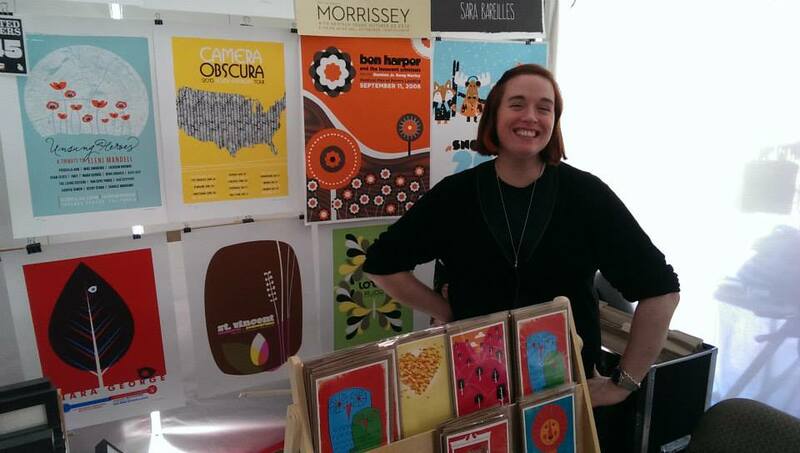 Who: Over 80 artisans and craftspeople from the Pittsburgh showing and selling their work. What: Mt. Lebanon Artists’ Market, an annual juried art festival. Where: In Mt. Lebanon, PA just outside of Pittsburgh, PA. The The Artists’ Market will be located on Academy Avenue & Washington Road 15228. When: Saturday September 26 & Sunday 27, 2015. The hours are 10am – 6pm Saturday & 10am – 5pm on Sunday. 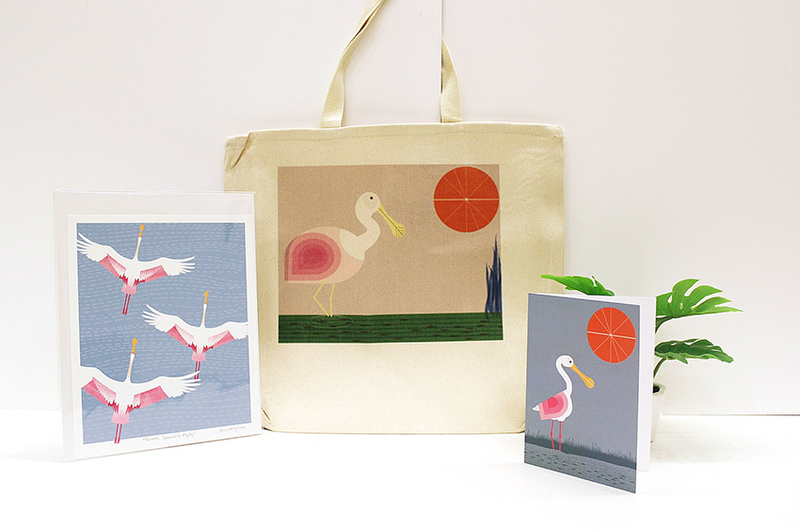 We will have our Alphabet Prints, Rock Posters, Art Prints, Cardinal Seasons Prints, Lunchbags and more on hand, as well as new pieces. So come on out and enjoy the day with us! Hooray! It’s Handmade Arcade Time on December 7th! Yinz guys! It’s finally time for Handmade Arcade! 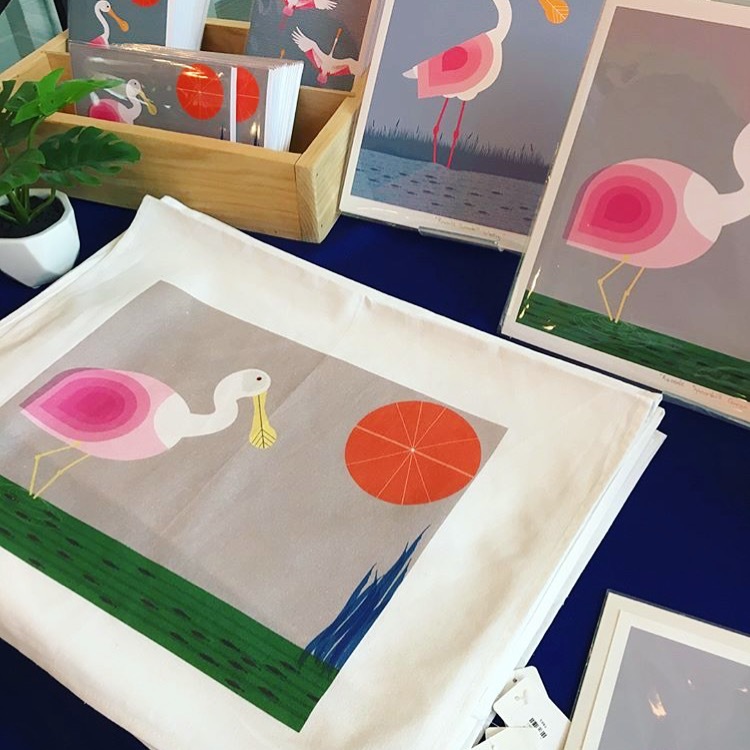 On Saturday (and Saturday ONLY) December 7th, Pittsburgh’s biggest and most spectacular array of handmade makers, talent, artists and crafters arrive from all over the country for the amazing Handmade Arcade. It’s one of our favorite shows of the entire year, and we’re so thrilled for Handmade Arcade’s special ten-year anniversary and can’t be more honored to be vending at this truly one-of-a-kind show. And trust us, we do shows all over the country! HA pulls in shoppers from the tri-state area to find lovely and well crafted handmade pieces for everyone their holiday shopping lists. Handmade Arcade is not to be missed. We will have lots of new pieces and hand printed, and hand drawn art prints, rock posters, and more on hand, as well as a special collection of framed prints, ready to be gifted right away! Handmade Arcade is FREE to attend and is very family-friendly. For a full list of 2013 Vendors click here. What: Handmade Arcade, the region’s largest independent and handmade craft fair. now in it’s 10th year. A highly anticipated annual event, HA attracts more than 8,000 attendees in one day. HA provides craft artists working outside mainstream and fine arts sectors with a grassroots, high-visibility venue to sell wares, build community, network, and share their artistic practice. Where: The David L. Lawrence Convention Center, in Downtown Pittsburgh, PA. For directions and parking information click here. When: Saturday, December 7, 2013 from 11am to 7pm. ONE DAY ONLY! Why: Because Handmade, right here in the USA is best! Handmade Arcade features tons of super cool maker demos and fun hands-on projects to create all sorts of make-and-take items in the Hands-On-Handmade section including screenprinting demos by Artists Image Resource (AIR), (where we learned to hand pull our screenprints!) DIY collar making by ModCloth, LED accessory making by Assemble, and so much more. Click here for the full list! Early Birdie Passes are available for $15 each, which provide shoppers with the exclusive opportunity to shop one hour before the event opens to the public. Early Birdie shoppers will have first pick to purchase all the unique and one-of-a-kind items that crafters will be selling and be given a bag full of goodies and coupons. (Children 12 and under are admitted free with an adult.) Passes can be purchased online or at Wildcard at 4209 Butler Street Pittsburgh, PA 15201. This year’s Handmade Arcade will also feature welcoming live musical entertainment by Colonel Eagleburger’s Highstepping Goodtime Band and pop-up performances by Continuum Dance Theater. Throughout the day, Handmade Arcade will feature DJ sets by Pandemic, Bad Seed, Max Terasauro of Pittsburgh Record Fest and The Garment District. Lunch items, snacks and refreshments will be available for sale on site. For more Shopper Info including directions and parking information click here! Hope to see you there!